Snakes are one of the unique species of wildlife. Snakes can be found living in attics, crawlspaces, patios and basements in homes and offices. They can also find home in hot tubs, under sheds and outbuildings. Call us immediately upon discovering a snake in your residential or commercial property. Action Wildlife Removal has trained professional experts offering snake control and snake removal services. Snake control is the solution to different varieties of snakes that are an increasingly becoming a problem in Mississauga, Brampton, Orangeville, Caledon, Bolton, Guelph and Georgetown. Whether the snakes are venomous or non-venomous, the dangers of having them on your property do not stop. These reptiles have loads of bacteria in their mouths which can easily be transported to people with a single bite. Although snakes are not overly aggressive, they will defend themselves when threatened. This is why it is always important to consider professional snake control services. It is also important to know the snake species because in order to treat the venomous snake bites, the hospital has to be aware of the type of snake which injected the venom. As more and more of these reptiles get released into the wild, it becomes difficult to identify snakes without a professional snake removal expert. Snake removal is a simple process, if done by a person with years of experience. Most venomous snake bites only occur when inexperienced people try to catch or kill the snake. Action Wildlife Removal offers professional snake removal services in Mississauga, Brampton, Orangeville, Caledon, Bolton, Guelph and Georgetown. Our pest control technicians have years of experience in performing snake exclusion and removal services. Snakes are captured safely, and humanely relocated to an area where they can continue to live a healthy, natural life. We do not harm them in any way, other than giving them the scary experience of being put into a bucket and riding in the truck. We release snakes to areas with adequate food, water, and shelter, and away from human habitat. 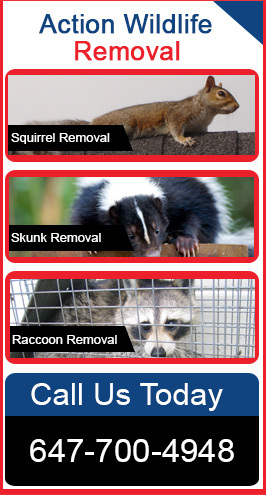 Action Wildlife Removal provides wildlife management to both residential and commercial properties. In addition to snakes, we also offer control and removal services for bats, squirrels, skunks raccoons, geese, birds and all other nuisance wildlife. To learn more about our wildlife solutions, feel free to contact us to request an inspection.